Katie, is that a picture of Waffles on your cell wall? Me is starting to get a little worried about yous and that intern of yours. 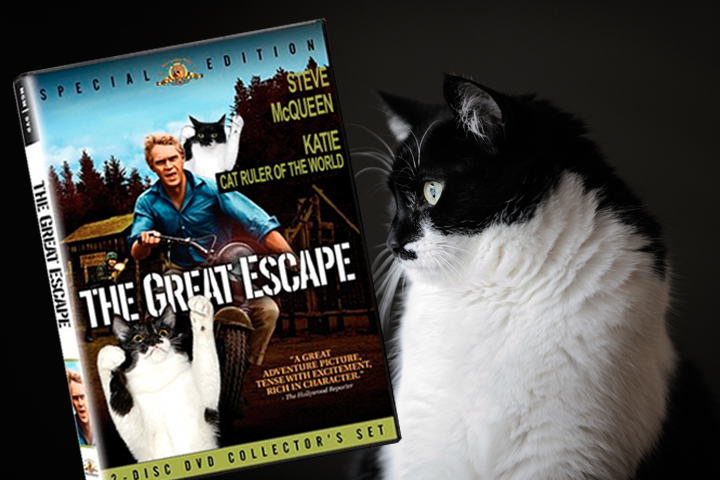 Don't forget that pawsome scratching post when you make that escape! Katie, you need a "stay out of jail" card! Odin wants to be your Steve McQueen. We like this Katie. Nice prison "uni"
Hmmm... ya know I'm wondering what's happened to Waffles, he seems to be missing right as you end up in the slammer. Could it be he was a criminal mastermind all this time and he's framed you dear Katie? Hey, if you do get in trouble now you can give yourself a pardon! Brian has a point we thinks you should make pardons up for yourself and all your friends. Someone did this in a book we read. They made all these life-time pardons up for their friends while they were President of the U.S. and whenever they needed them they just whipped them out. We thinks it was a Tom Clancey novel. 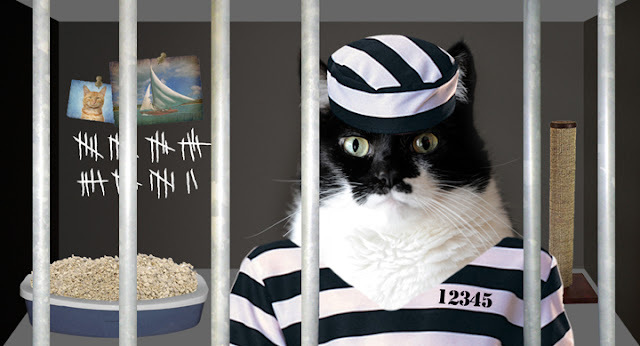 We hear you get "3 hots and a cot" in jail, but we see you traded the cot out for a scratchy post, good move! great play on words Katie,but you do seem to have this thing about jails don't you? Horizontal stripes, Katie? Really? What's next... white after Labor Day? This was not the fashion forward trend I was expecting from the newly crowned Cat Ruler of the World! Waffles, get Katie a wardrobe consultant, pronto!! Hey, Katie, now you can add movie star to your list of accomplishments! Well now you are leaving us suspended in outer space waiting for what you are going to do. Tell us more please. Are you the mistress of disguises Katie? A...a...PINUP...of...WAFFLES? Hrm...let's just start that rumor-mill up shall we? You know how people love gossiping about peeps in politics - MOL! Phew! You had us worried for a minute there. Thanks for the advice about altering our template width, but when we went to design or whatever it is called now, it said it wasn't applicable to our template. Oh well, get ready for more bad words and tantrums when mum does our next post! I am so laughing. Oh Katie, you should really be the star of a book for children! *rolls eyes* Seriously, man, my pic isn't in your cell? Anyone could escape cos there's a bar missing. HAH! You make the best photohopped pictures... forgive me if it's not the text that I often visit in this page. The pictures alone can say a thousand words. I demand to see this remake!